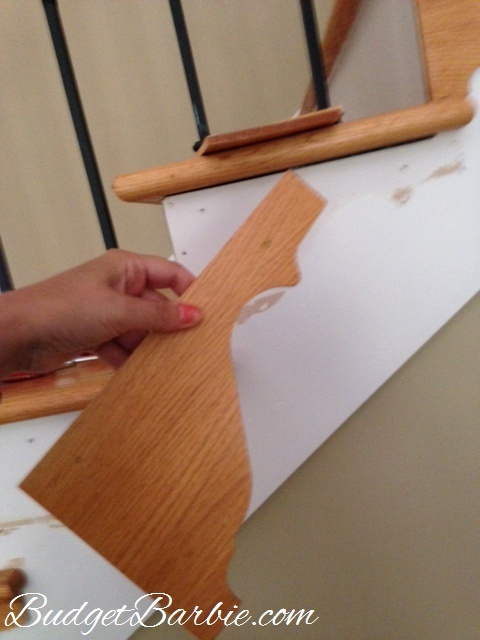 I know I updated last Fall - the photos of the process of removing the ugly wood scroll trim from the stairs but I am not sure I ever did the final 'finish' post. So if you are joining me for the first time now, I'll recap and then show the finish at the end! The ugly wood scrolls on the stairs bugged us from the day we moved in, but soon we got used to them and they went lower and lower on the priority list of projects. We discussed options - do we remove them? Paint them a different color? Paint them the same color? 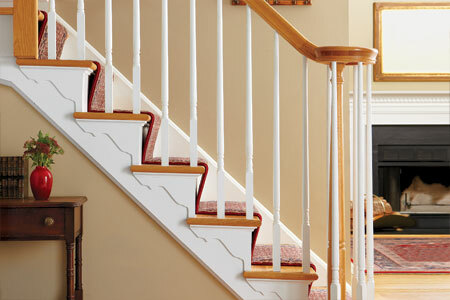 I found a photo online of someone who painted them white like the stairs they were attached to. One day I just wanted them gone so I started to pry them off and remove them. All the scroll trim was taken off. 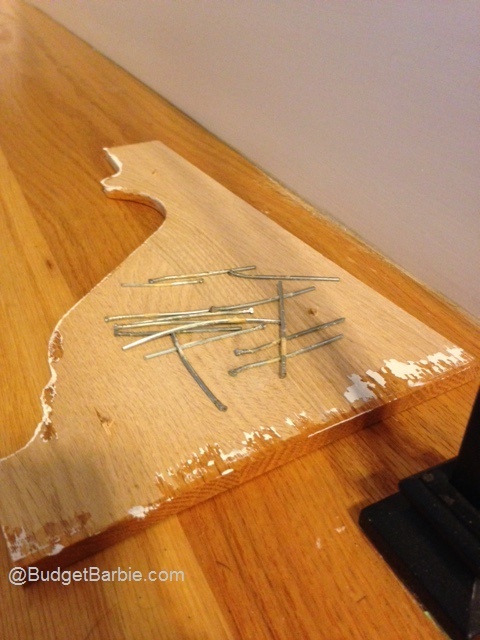 Leaving not only the marks where they were, but a billion nail holes. On a previous post I went into details - but the next steps were to sand down the sides of the stairs to remove the marks and the paint that had been painted around the scrolls and built up a little lip. 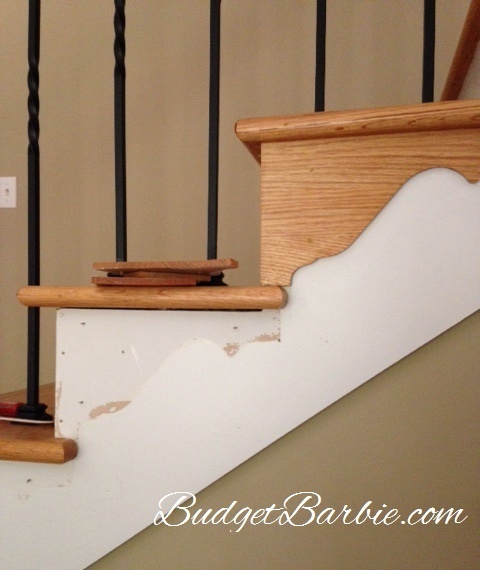 You can see how the scroll trim also had covered the edges of the stairs - which were unfinished. After the scrolls were removed and the stairs repainted it already looked 100% better! The last step was to cover those unfinished corners that had been covered by the scrolls. We didn't realize this when I started to remove them so after thinking about my options, I bought some corner bead at Lowe's. I think that's what it's called. Long wood strips of moulding trim that fit over wall corners. We cut them to size for each stair. It's important to measure EACH corner of EACH stair as they were *not* uniform in size even though you would have thought so. I mixed different shades of wood stain we had on hand in a 'trial and error' to try to match the color of the wood treads on the stairs. Once I got a color I thought was close, I stained them all. I wanted to mention I also decided to paint the front of the stairs. If you thought the shading of the pictures on the front of the stairs happened to perfectly match the walls, you would be correct that it matched, but it isn't just the shade. 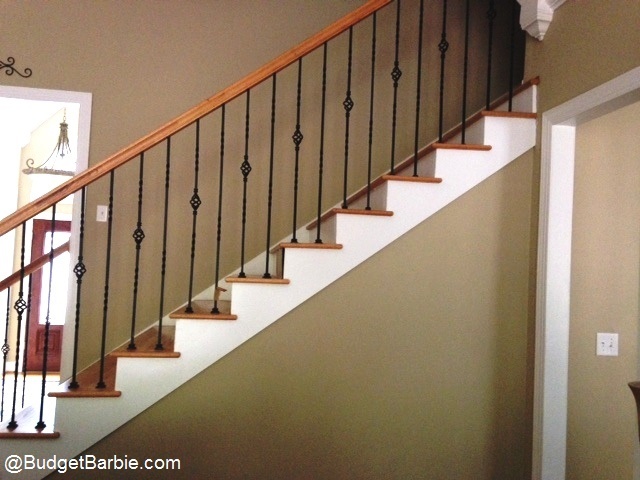 Using the same color paint as the walls, only in a more durable finish, the stairs were painted.